The Bromeliads started out life in a 350-foot studio apartment. 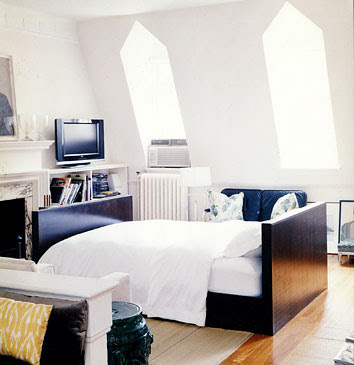 We slept on a murphy bed, which made tidying up in the morning a snap (literally). Also our "bedroom" instantly converted into a living room as soon as the bed was put up. However, a bed planted firmly in the middle of the living room doesn't always look so bad either. 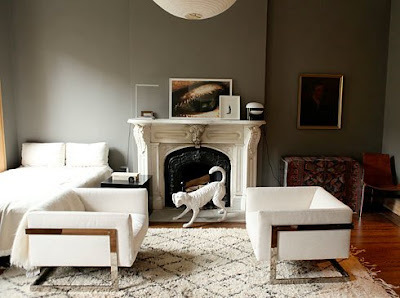 Take for example the living room of uber designer Thomas O'Brien. Technically it's not a studio aparment; he chose to put the bed in the living room and turned the bedroom into an office/dressing room. He even serves dinner at the foot of the bed. Below are a few more bed-in- a-living-area combos that I could live with. 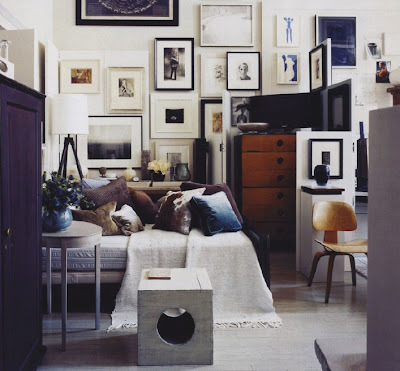 Have you ever lived in a studio apartment? What did you do with your bed? Images: Unknown via Angelo: Home; House & Garden; Elle Decor; Apartment Therapy; unknown; Tom Delavan; Gustavo Martinez; Vincente Wolf in Metropolitan Home. 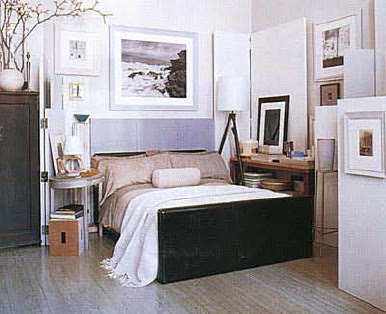 Mmm...this is inspiring should I ever move to a smaller place, which I imagine will be inevitable one day. I live in a studio now. This is my first time since college contending with having a bed in the same room as my living space. 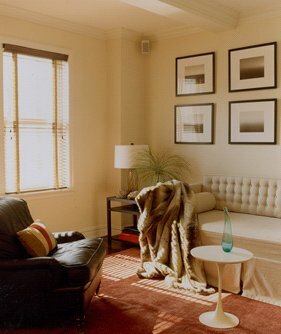 While we had initially thought about secreting it behind bookcases or something like that, but in the end, the middle-of-the-room treatment worked best. I still need to figure out how to decorate the area around the bed, however. Sigh. Never lived in a studio. When I was in the northeast I always had a roommate and then moved to TX where square footage is cheap. 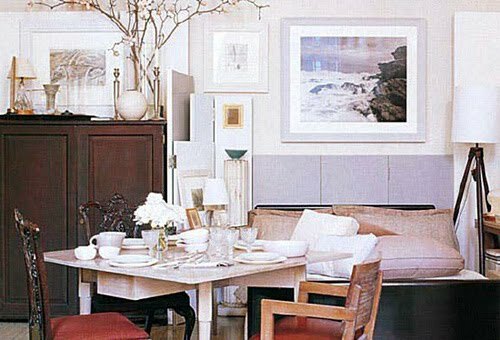 Love O'Brien's studio and I see the appeal to single room living, but I'm not sure I could do it if I lived with anyone else. I def like my space. 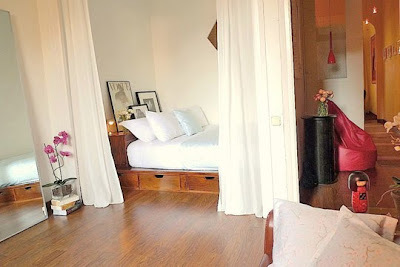 I lived in a studio in Paris, it was teeny tiny, a chambre de bonne, but rather cleverly kitted out by the landlady. 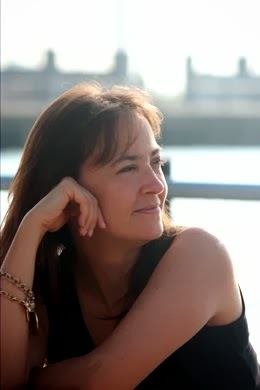 She'd even squeezed in a bistro chair and table as my dining table/work table, and built shelves from floor to ceiling. The main wall was basically split into thirds, one third being the kitchenette. Being small, the bathroom was fine for me but taller people found it tricky! Fond memories, it was cosy and cute. Now I have my own apartment in London - it's technically a one-bed but I have three big floor-to-ceiling sliding panels that seperate the bedroom from the lounge. I usually keep them closed, as they are doors, but occasionally like to open it all up - am inspired to do so tonight after this post! PS I loved New York. I'll be back! I did live in a studio once. The bed was in one corner and everything else was on the other side of the room so I could pretend I had a bedroom. Looking back, I don't know how I lived like that. Oops. Hit the button too soon. I was going to say, I would be much more creative now. Being older and wiser and all. 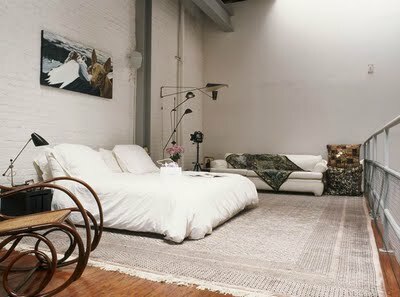 I've never lived in a studio apartment, but those are really beautiful rooms. 250 square foot studio! I've always loved that first room! i have not lived in a studio apartment but if i had a choice, i would take that second one in a heartbeat.